This week I am eagerly anticipating Internment by Samira Ahmed! The book takes place in a near future US that is eerily possible. The main character Layla has been forced into an internment camp for Muslim Americans. Considering how many Muslim Americans are currently treated and how we treat immigrants and asylum seekers at our southern border, the premise of the book seems all to possible. Like her first novel Love, Hate, and Other Filters, I expect Internment to be both a success and culturally important. Samira Ahmed takes the past we have vowed to never repeat and places it in our hypothetical future. 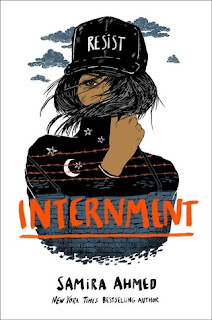 I have no doubt that Internment will be amazing, and Samira Ahmed is a powerhouse to watch!